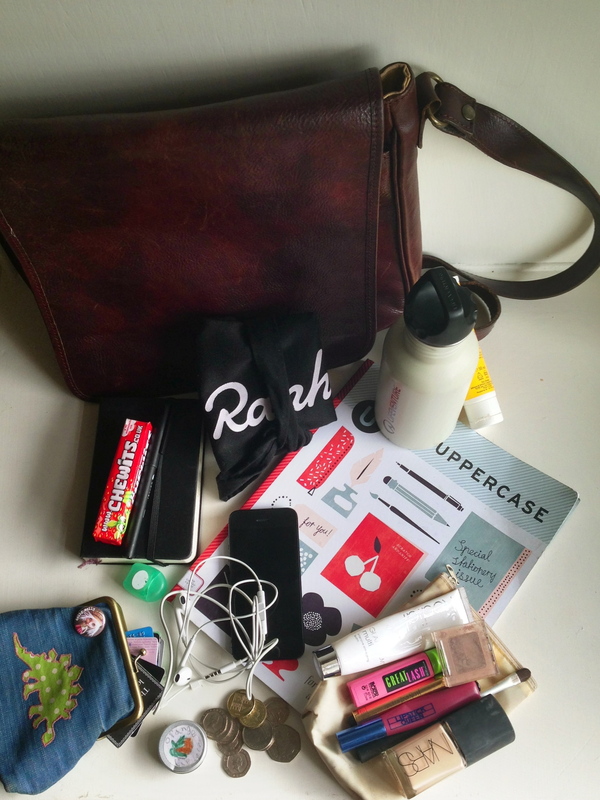 Regular blog readers might remember me writing a ‘what’s in your handbag’ post ages ago. Shortly after which the bag in question, along with its contents, was stolen from my kitchen. Thankfully it was all insured, and therefore replaced with shiny new things! Huzzah! The bag that I carry around switches between a silver Cambridge Satchel, a Mary Katrantzou for Longchamp tote, and a brown leather satchel that my Dad gave me to replace my beloved stolen Mulberry Antony. Each of the bags is useful for different occasions, but the one I have today is the brown leather one. Simple, logo-free and with enough pockets for me to endlessly think I’ve lost something, this bag is perfect for slinging across my shoulders and leaving my hands free for important things like ice-cream eating, hand-holding (romantically with my other half, or to stop my kids jumping into a lake) or endless Tweeting. I like to carry a lot of stuff. So, small fancy bags are not really any good for me and this list really does prove it! Suncream. I used some chemical peel pads earlier this year and although they’ve improved my skin lots, they have left it very sensitive to the sun. Daily suncream is essential now. This one is by ROC. Moleskine diary and fineliner pen. Because although I love technology, nothing beats pen and paper. My purse. I love, love, love this purse. It was made for me by the talented Abi of ‘Sew You’ and it’s large enough to hold my keys, lipbalm, iPhone earphones, and a tiny box of dental floss as well as my cash and cards. After my last one was stolen, she sent me a free replacement, which just proves how fabulous she is. Lifeventure water bottle. Reason enough for a giant bag! I carry water with me all the time after a kidney infection earlier this year, and the bottle – bought for me by my beloved – is with me every day. A packet of Chewits. Because you never know when the Chewit Monster might strike! Remember him? Actually, I have to confess that, having discovered them in my bag when I emptied it to take the photo, I’m eating them right now, as I type. I quite often have a little something sugary in my bag. To placate my children – what a mother – or to to give me a little energy boost at 3pm. I know, I know, I should be eating fruit or almonds or something. But I’m not. A magazine. In this case, the wonderful stationery-special issue 17 of Uppercase. For many, many reasons. It has a scratch ‘n’ sniff cover, for a start! Scratch’n’sniff! I know that at the age of 37, I should have grown out of such things, but it’s cherry, so therefore brilliant. I always have something to read in my bag. Being a public transport user, I never know when I’ll end up stuck somewhere and I prefer my reading material in print, not via e-reader. Books never die. A Rapha musette. A gift from my lovely boyfriend, this little bag is often with me so that I don’t have to use carrier bags in shops. And finally, my beloved iPhone 5. At 64GB, this is worth more than my car and I love it almost as though it were my third child. I’m not even joking (much) about that. My addiction to Twitter, Instagram, Pinterest, and, I confess here … Happy Street … mean that I never want to be without it. This post will be entered into a Money Supermarket competition. 2 Responses to What’s in your handbag? Least not because I got a mention. But because I love bags (man bags mind), Chewit monsters (yes they are a species not just an individual) and because a notepad beats a virtual pad every time (except in the dark).